Hello everyone! My name is Susana and i am a guest blogger on this wonderful site for the amazing Sea Save! Just a quick little explanation on who i am and why i am here so that you can all get to know me a little better. I have loved the ocean since i was a little girl; after all, i was born in an island! When i was about 10 years old i had an experience with a dolphin that forever changed my life and it was from that moment that i knew i wanted to help protect them and all of the living creatures of the seas. I began doing research on alligators and sharks in 2006 and i did that for 3 years and that's what got me into conservation, particularly sharks. I've begun my own local grassroots organization and i have done a tremendous amount of work with local, nationwide and worldwide shark organizations! It is my goal to spread the word about the troubles our oceans are in but always making sure i do it in a fun, and positive way! I can't wait to learn more from Sea Save and i also can't wait to connect with all of you! Feel free to shoot me a tweet at, @SeaSaveTweet . 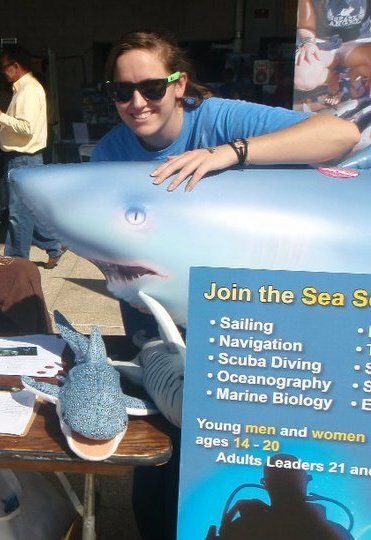 In the photo below, that was me doing some grassroots work for a local shark organization!